Continuing from yesterday’s post, I’m looking at the first lines from some of my favorite stories to see why they work. I picked stories that aren’t very recent, and are either by people I don’t know or by writers I met after reading the story. If I do it again, I may relax that rule, but it seemed like a good way to start out. I only used stories that are online so you can go see how the story progresses if you wish. Again, if this turns out to be interesting to me or other folks, I may do more. There’s definitely a mystery here — what’s the call? “Wheezing” gives us a sense of the character’s age, perhaps–at least that she is unlikely to be a very young athlete–since she is still wheezing even though her uphill run is regular enough to be referred to as “my late-afternoon run.” She’s athletic, but in a real-person-exercising sort of way. Other than that, I don’t have much. It’s fine. It’s an appealing sentence, tightly written, and I’m happy to move on with it. Conversational. Establishes a relationship between the reader and the narrator immediately — “I” and “you” (and also suggests the reader isn’t actually the “you” being addressed. Is there a term for that?). The questions it poses are obvious — who is speaking? Who am “I?” What voicemail? I suppose, given that it’s the story it is, it also sets up the reader for some irony–that this story about the postal mail begins with a voice mail. I really like this sentence. Utterly simple, utterly direct. Again, the mystery is obvious–what is the blood? The fact that Yalnis doesn’t know only makes it more urgent. It drives the reader rapidly to the next line. There’s not a lot to say about it. It’s just good. Another setting sentence. We’ve got the titular library, and the reinforcement from this sentence that it is important. Actually, that’s misleading. It’s not a *titular* library–in fact, the library is called a house. Backing up to the title, which the reader has as a cue along with the first sentence, the emphasis is on location. This isn’t the story of the seven librarians, but rather the library–but the library is defined by its relationships. 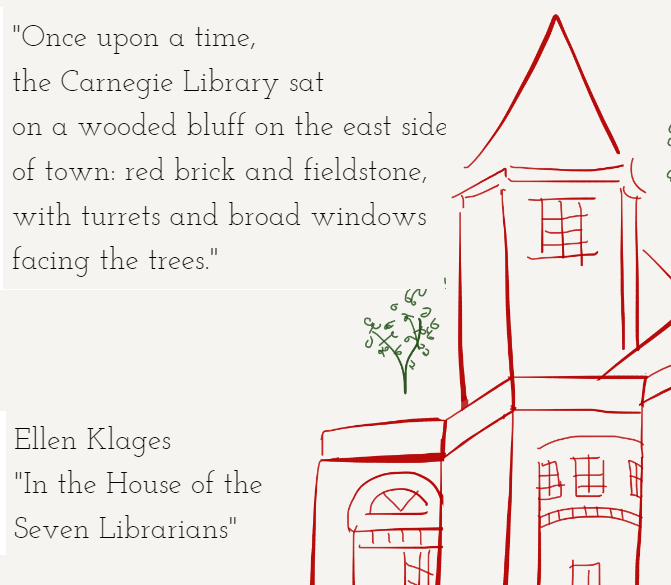 It is the “house” of the librarians; the story is what happens inside it. So, moving back. Now this sentence is reaffirming what the title suggests–setting is vital here. The story takes place inside; the first sentence tells us about the outside. I suppose, if we want to overextend a metaphor, we could say it’s the cover of the story. The descriptions are all aligned to evoke the kind of library readers sigh over. “Wooded bluff” “broad windows facing the trees” — a picturesque, beautiful location, which the broad windows suggest is filled with light. Let’s be honest, this is reader fanservice. Personally, I’m good with that. Her name is Ana Alvarado, and she’s having a bad day. This is a fine sentence. It tells us what we need to know and suggests we get on with things. We have a who (Ana Alvarado) and a what (she’s having a bad day). Next, we’ll get the why. Almost journalistic. It also sets up a narrator who has a personality separate from that of the characters. It might be another character, or it might just be the narrative perspective from which the story is told, but this sentence creates an immediate distancing effect. The reader is observing, not participating. From this, I learned a couple things. It might be easier to do textual analysis on stories I’d read more recently. I don’t seem to select for first sentences particularly when I’m choosing my favorite stories. These are all good, but only a couple dazzle. That’s not surprising. A good first sentence is a tiny element of a story, nice but unnecessary. I might try tracking really good first sentences, though, if I remember (I won’t). This entry was posted in Writing Advice by Rachel Swirsky. Bookmark the permalink.